We’ve all seen the ads on eBay for inexpensive PCB’s from Asia, sprouting tube sockets and a few other parts for about $60, tubes included. If you’re like me, you’ve wondered if these can be any good at all – or just a waste of money and time. The glass half full person might say, “How bad can they be?” The glass half empty person might say, “How good can they be?” Or maybe it’s the other way around. At any rate, this faithful audio scribe is going to take one for the team and find out. I’ll also build a more expensive line stage amplifier based on a board from the USA and compare it to its Eastern rival. The aim of this article is to inform, encourage DIY audio, and satisfy my own curiosity of course. Now before you tune out, thinking; a) I don’t want to fool around with something that has several hundred volts running through it and b) my significant other won’t tolerate something that looks like a pile of junk with tubes and wires hanging out of it, both of these LSA’s have less than 100 volts DC coursing through their electronic veins, and if either or both of them prove worthy I’ll put them in nice cases to keep the SAF on the plus side of the ledger. A line stage should have a pretty easy job of it, right? You might think so, but the more line stages I listen to, the more I’ve come to believe it’s not necessarily so. A line stage should in essence just get out of the way and let the signal flow from the source component to the power amp. If I have to, I can listen past a power amp that sounds a little tubby in the bass (I’m doing that right now), and still enjoy it for the most part. A digital source that is not quite on its game, I can let a little go there as well. But a line stage that just seems to get in the way of the music and doesn’t play well with the source component and/or power amp, well, I’m very particular and quick to judge, let me tell you. I’ll set aside for the present ‘passive’ preamps and ‘integrated’ amps that are essentially power amps that have a volume pot just upstream from their input jacks. Now I don’t expect either of these bargain stages to kick my ARC Reference 3 off of its place of honour on my equipment stand, but I am fairly certain that I can eclipse the cost/performance ratio of the ARC. But will this leave me something worth listening to? Will my target price of 400 to 500 Canadian dollars for a complete line stage in a decent case be too ambitious for something worthy of audiophile consideration? Time will tell. I once heard a wine writer interviewed on CBC radio say that good cheap wines don’t do everything well. They do one or two things well, and what they don’t get right, they don’t get glaringly wrong. That sounds like a good thing to aim for in cheap; and maybe I should stop using the word cheap.. let’s call them ‘high-value’ line stages. Along the way to discovering a decent, high-value line stage I’m expecting to have some fun sampling a few different tube vintages. I had originally intended to present the board from the Far East first but for reasons that will become clear in the second installment I’ve changed it up and will evaluate the board from the USA first. I know, sounds Asian, doesn’t it? But this is the work of John Broskie, an American who, through his websites, tubecad.com and glass-ware.com, sells tube modeling software, and kits of parts for line stages, headphone amps, phono preamps and power supplies. Broskie also publishes a blog that explores tube circuit design and topology. The sale of kits supports the blog, though how is a mystery to me. The kits are, to put it mildly, a great deal. Everything you see in the picture above sells for $164 US. The board shown above with all parts except the tubes sells for $78 US. The board on its own is $29 US. The international shipping charges are reasonable as well, and it ships from the USA. A manual is included with all purchases. The manual does not give step by step instructions, but the schematic is shown and described, the parts values are given and basic assembly tips and procedures are conveyed. All parts are individually bagged and labelled. Input selectors and stepped attenuators can be purchased from tubecad as well but in the interest of economy, I bought a generic $5 selector switch. I did splash out a bit, and equipped this LSA with a $20 Alps Blue Velvet volume pot. The board uses 6DJ8 tubes, or its similar variants 6922, E88CC etc. New production tubes start at less $20 each and NOS stocks exist from about $20 each, if you shop around a bit. If you are thinking about buying a board, wait until you’ve read the results of the tube rolling to see if my sonic impressions of the JJ E88CC tubes fall in line with what you might like. If the JJs don’t match what you consider optimal you might want to order the kit without tubes and source ones more to your liking elsewhere, or possibly raid your own stash. Many of the low priced new and NOS tubes sound really good, there’s no need to spend big bucks on the expensive NOS ones to get decent sound. Note: Despite what you might read on the web the Russian 6N1P tube is NOT a substitute for any of the 6DJ8 family of tubes, click on the link below and scroll down about half a page. The Aikido 12Vac is a kit, and the buyer must assemble the parts to the board and solder them. If this sounds too daunting, relax, I’ll take you newbies through it step by step in a future installment. I’m assuming that anyone attempting either of the two line stages has a soldering iron and knows which end is the hot one. A temperature controlled iron is preferred. The link below is one possibility. A digital multimeter is essential but an inexpensive one from Canadian Tire, Princess Auto or other source will usually suffice, an example is shown below. Please note that I am in not connected with, nor do I receive compensation of any sort from tubecad.com, or any of the other sources mentioned. I have purchased a few of the kits from tubecad, and have scratch-built a few of the circuits as well. I have purchased tubes and parts from thetubestore.com and partsconnexion.com. The Tubecad Aikido 12Vac board quality is, in a word, superb. It is 2.4mm thick, about 50% thicker than other boards you’ll find in this price range. The copper traces are wide and thick, and all holes are plated through. If you buy the board with parts (with tubes or without), standoffs are included to mount the board to your chassis. There are five mounting holes, one at each corner and one centered between the tubes. You may tube roll ‘til your heart’s content without fear of damage, due to the superior rigidity of the board. There are multiple holes for most components, so if for instance you want to upgrade the output caps, many audiophile grade types can be easily accommodated. The only drawback is, should you wish to change parts, it’s doubly difficult to remove the existing ones. If this project appeals, and you are considering parts upgrades – do it right from the get go. The 12Vac Aikido can be ordered in an 18 volt version using 12AU7 tubes. 12AU7’s in my experience don’t make good gain-stage tubes. Added to this is the fact that the DC voltage with an 18 volt transformer approaches the 150 volt mark. 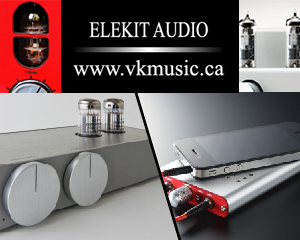 The 12 volt version using 6DJ8 tubes offers more tube rolling choices, always a good thing. The quality of parts included in the kit is not extravagant, but decent, especially for the price; all parts are by brand name manufacturers. The six power supply diodes are fast recovery, low-noise types that cost one or two orders of magnitude more than generic 1N400X diodes. The output caps are decent, but nothing special. I’m replacing the caps included in the kit with ones sporting a bit more audiophile cred, that have been gathering dust in my stash of parts. One option you have when ordering is the choice of carbon film or metal film resistors. You get to decide which side of the resistor divide you fall on. I’m an old geezer with a carbon preference, but don’t let that influence you. The Aikido circuit is quite simple and does not have any loop feedback, a good thing in my book. There is only one coupling capacitor in the amplification chain. Another Aikido feature is a part of the circuit that cancels most of any remaining power supply noise from the audio output. This variant of the Aikido design is called the 12Vac because the board has an ingenious power supply that allows a single 12 volt transformer to supply the filament voltage, and 80 volts to the tube anodes (plates to us old-timers). The circuit may be powered by a 12 volt 2 amp wallwart, but I’ve opted for a good quality toroidal transformer in the same chassis as the board, like a ‘real’ audio component. The Aikido power supply, except for the transformer, is on the board with the amplification stages. I think it’s only fair that I declare my biases. I really like what I’ve heard from the Aikido circuits up to this point. Nearly all of my Aikido listening has been headphone amps and phono preamps. I have only briefly had an Aikido line stage in my system, and did very little serious listening at the time. I’m curious to see how this ‘junior’ Aikido stacks up against my ‘big gun’ ARC line stage. Some people on the DIY audio forums discount the value of the Aikido circuit, proclaiming it a theoretically invalid design that doesn’t offer the power supply noise cancellation aspects it purports. I am of the opinion that the most critical haven’t actually heard it. Most people who have actually built them like them. All the same, I’m not going to cut the baby Aikido any slack. I will present my listening impressions first, then detail the chassis prep and build procedure in later installments. I’ll list all parts required to make a finished line stage in a decent enclosure, with a cost break down if it proves worthy of audiophile consideration. I’ll also supply some sketches (aka pencil CAD) for those wishing to build their own. The Cambridge + Ref 3 + Ref 110 is normally an all-balanced setup, whereas the Aikido is single-ended. My Ref 110 is balanced input only (XLR connectors), but I’ve made a pair of single ended to balanced interconnects. This puts the Aikido at a bit of a disadvantage, but if time permits I’ll try an amp with single-ended inputs. One thing to note; the Aikido circuit inverts absolute phase. Not a big deal, just reverse your speaker connections either at the amp or at the speakers. My Ref 3 can reverse phase with the push of a button on the remote, and I’ve found that for the most part, I slightly prefer the sound of reversed phase. Substituting the Aikido into my rig does not require reversing any speaker wires. After some brief listening just to ensure the component under review works satisfactorily, I leave it to run for 24 hours with a CD on repeat or input from a tuner. I’ll usually have a quick listen, then leave it run another 24 hours or so before doing any serious critiquing. Occasionally I find a component that really grabs me after the first 24 hours, and I’ll start listening for pleasure then. If I find the component under review does not appeal after 24 hours, I’ll give it another 24 (48 total). If after 48 hours it still doesn’t grab me, I will let it run for another 5 days or so (150 hours total), just to make sure all of its parts have settled in. I have a selection of tracks that let me home in on the essential characteristics of a component quite quickly. Some years ago, I burned a CD containing tracks by Peter Gabriel, Sarah McLachlan, Loreena McKennitt and Mark Knopfler. Not many of them are demonstration quality, and a few are far from perfect, but they are music I like and I’ve not gotten bored of, even through hundreds of hearings. My auditioning is not limited to these tracks but I start out with them as I can cut to the chase very quickly with regards to sound quality. Once this is done I just play whatever strikes my fancy for pleasure. If indeed it is a pleasurable experience. I consider my ARC Ref 3 and Ref 110 the heart of my system, the two just seem to work magically together. They’re not perfect though; they require at least an hour of running time before they sound their best. The Ref 110 also has fans to cool the output tubes. Even on the lowest setting they are too noisy and can be heard during quiet musical passages. This kind of defeats the purpose of high end audio when the amp raises the noise floor in the listening room, potentially obscuring musical detail. Frustration dictated that the fan noise had to go, so I cut their leads, but now I have to remove the cover each time I use the amp, so the eight 6550 output tubes don’t become over-cooked. There are no children in my household, except for me of course, and no pets, so the danger level is relatively low. With only 10 hours running time, the Aikido doesn’t sound too bad. The low bass is not as forceful as the Ref 3. Not MIA, just a little shelved down in comparison, and not quite as dynamic. The midrange and treble aren’t quite as clearly resolved, but not drastically so. The Aikido needs to break in a bit, so I’ll leave it going overnight and have another listen after 24 hours of running time have accumulated. I’ve just remembered that my Cambridge CD player doesn’t sound its best, especially in the bass, when run single-ended. The next time I listen I’ll compare the Ref 3 fed single-ended from the Cambridge before switching over to the Aikido. When I acquired the Ref 3 (second-hand for about fourty percent of its new cost), it replaced a Musical Fidelity F22 line stage, which at the time (mid 1990’s) set me back over $2000. I was never completely happy with the MF. No combination of tubes could get it to sound dynamic, resolving and musical. At one end of the tube rolling spectrum it sounded smooth, but rolled-off and dynamically challenged. The other extreme had dynamic and forceful bass, but harsh and in-your-face upper-midrange and treble. Replacing the coupling caps helped a bit, but I could never find a middle ground that was a good balance, despite trying many different tubes. The Ref 3, when it came into my system about 6 years ago, proved to be the magic bullet. When the Ref 110 power amp came along a little later, it was one of those ‘be careful what you wish for stories’, but that’s a tale for another day. The Aikido with 24 hours on it sounds far better than the Musical Fidelity F22 ever did. When compared to the Ref 3, with a single-ended input from my Cambridge CD player, the Aikido can hold its little head high. The Aikido is not as resolving or dynamic, nor does it have as much musical drive and flow as the Ref 3. It also lacks a bit of resolving power and the ability to sort out complex, high level musical passages that the ARC effortlessly delivers. Imaging is something that I don’t specifically listen for in an audio system. I find that if I do listen for it I ignore the music. which sort of defeats the purpose of listening in the first place. It’s one of those things that is just not that important to me. That being said, the Ref 3 is better at presenting depth behind the plane of the speakers. The Aikido is a bit squashed front to back, by comparison, but not drastically so. The Aikido punches far above its weight. If I had to put a number on it I’d say the Aikido delivers about 2/3 of the performance of the Reference 3, on my usual demo tracks. That the Aikido can be built for about 1/10 of what I paid for my Ref 3 used is nothing short of amazing. One thing I’ve learned about my Ref 3 is that it doesn’t play well with single-ended components on either side of it. It didn’t sound its best with the single-ended input of a power amp I was listening to a few weeks ago. It might be a peculiarity of my system, but it doesn’t sound its best, especially in the bass, when run single-ended from my Cambridge CD player. The bass was a noticeably indistinct and slow – the Aikido was better in this regard. Going back to balanced connections returned the advantage Ref 3, its bass was again deeper and more forceful than the Aikido. After restoring the balanced connection between the Cambridge and Ref 3, I picked out a CD I haven’t listened to in years; The Academy of St. Martin-in-the-Fields’ recording of The Lark Ascending by Ralph Vaughan Williams, on the ASV label. A digital recording from 1984, the violin tone is at times a bit steely and can set the fillings in my teeth resonating. I love the performance though; it is impassioned and gripping, in a reserved English sort of way, of course. The Ref 3 connected up balanced was back ‘on song’. The music ebbed and flowed and I was captivated, involved and connected as it washed over me. In one way, the Aikido outperforms the Ref 3. The Aikido glosses over that last bit of high frequency detail and as a result is gentler on the occasionally screechy violins in the Vaughan Williams piece. Through the Aikido, the essence of the performance was there, but scaled back a bit. The image flattening was slightly more pronounced with the Vaughan Williams piece, than the compression I noticed on the tracks of my demo disc. All that being said, the little Aikido is still fun to listen to. It has pace and drive, it doesn’t sound slow. Music flows and my toe taps. I don’t get the feeling that I’m missing a huge amount of musical enjoyment compared to my big-buck line stage. Yes, the Ref 3 is better, but the Aikido is not drastically worse. If I assign an arbitrary sonic ‘goodness’ of 1.0 to my Ref 3, then a rating of around 0.6 would be appropriate for the Aikido. This might seem a bit harsh, but numbers don’t tell the whole story. I certainly didn’t feel the Aikido was 40% less entertaining. My Ref 3 might sell for $3,000 in the current market and the Aikido as shown in the pictures can be built for about $500; exact prices to follow in a future installment. You do the math: does this sound like a good deal and a compromise worth making? The Aikido is a fine line stage, period. No cost qualifier is needed. I don’t consider myself a golden-eared audiophile, maybe somewhere between silver and bronze on a good day. Audiophilia is very subjective; you might hear the Aikido and say it offers less than half of the performance of the Ref 3. Even at that I still think you would be, if not bowled over, certainly impressed with the little Aikido’s performance versus its price. Like a good inexpensive wine, it pleases greatly and offends only slightly. This has me muttering and grinding my teeth; with the CD player on pause and my ear pressed against my speaker’s tweeter, the ARC has a very, very slight buzz. The buzz can’t be heard at all from about 2 inches away. The Aikido has an extremely faint hiss that is even lower in level than the buzz of the Ref 3. The other area in which the Aikido betters the Ref 3 is the cost of re-tubing. The Aikido can be done for about $100, the Ref 3, closer to $500. 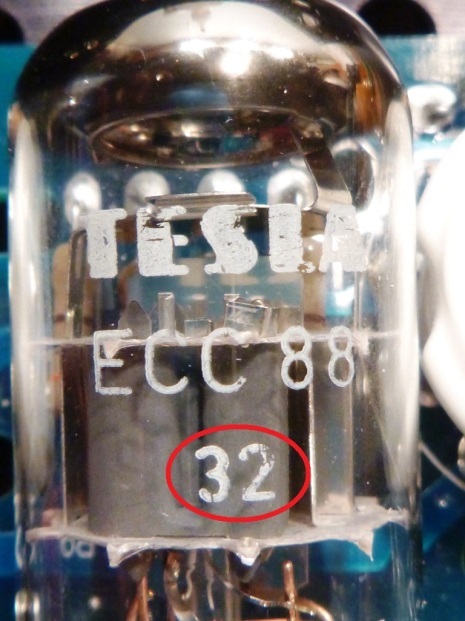 So far, the listening tests have been with NOS Tesla ECC88 tubes. These are my go-to, inexpensive choice in the 6DJ8/ECC88/6922 etc. family of tubes. The ECC88 Teslas sound much like a classic Mullard Blackburn 6DJ8 to me, in that they have bounce, drive, decent dynamics and extended frequency response, especially in the bass. The fact that the Teslas can be had for about $25 each makes them especially attractive. The fancier E88CC Teslas with gold plated pins may sound slightly better, but the cost/performance ratio of the plain-vanilla ECC88’s makes them the better deal. Let me pass on some Tesla lore to you. The best Teslas have factory code 32 on them. See the picture below. The factory code 37 tubes are not quite as good as the 32’s. The quality of the factory code 25 tubes have been disappointing in my experience. See the link below to a source I’ve found reliable for inexpensive Teslas. They are in the US so the shipping can be a bit pricey to Canada. At about 30 hours running time on the Teslas I’m replacing them with a set of JJ E88CC tubes. I’ll likely return to the Teslas later but I’m anxious to hear how the JJ’s compare. These are available for about $20 each in the chrome pin version, more if you want gold pins. The JJ’s will be left cooking away for 24 hours before I listen seriously. Compared to the Teslas, the JJ’s have a slightly more refined presentation. They still carry a tune well, they have drive and propulsion that has me tapping my toe. The midrange is a bit smoother and the highs are a bit more delicate compared to the Teslas. That’s not to say the mids and highs as less well resolved with the JJ’s, they’re just a bit smoother and slightly less aggressive. The JJ’s are slightly less forceful in the bass, but it’s a decent trade-off for their more beguiling midrange and treble. The JJ’s remind me of the classic Amperex Heerlen Bugle Boy 6DJ8. Up to this point I haven’t been a fan of the JJ ECC88’s, but I think I’ll have to revise my opinion. In this application they work very well. If you fancy this line stage and go ahead with building one, it would be hard to go wrong with either the JJ’s or the Teslas. If it doesn’t blow your budget, you could buy a set of each and decide for yourself. A quick word about tube buying: As any tube-o-phile will tell you, tubes can be problematic. I prefer wherever possible to buy locally or at least in country, so that if a problem develops it can be addressed quickly and with minimal shipping costs. See my preview of the Chinese line stage below. As well, tubes often have a short warranty period. When you receive tubes, try them in your amp right away. Put a few hours on them to make sure they function correctly even if purchased for your ‘inventory’ and you’re not planning to use them right away. One thing I find difficult to swallow is effusive hyperbole from equipment manufacturers, and glowing reviews from people associated with those same manufacturers. As I am both, to some extent, the manufacturer and associated reviewer I can understand if readers are skeptical of what I’ve written. I’m loaning the Aikido out for a week to an audiophile friend for his opinion. His system is very different than mine, as you will read below. The Aikido will substitute for his fully tweaked Bottlehead Foreplay-style line stage that has an expensive stepped attenuator, fairly pricey jacks, regulated power supply in a separate enclosure, some oil caps and Auricaps thrown in for good measure and other tweaks and fancy parts too numerous to mention. My set-up is: Linn Karik-Numerik CD-DAC as source, very-modded Bottlehead Foreplay pre-amp (with an exotic 6SN7 variant), Bryston 2B-SST amp, and Coincident Triumph speakers. I listened closely to a few CD’s with different sonic characteristics. Alison Krauss & Union Station, ‘New Favourite’ (Rounder CD 1166104952), showed that the Aikido carried her wonderful earthy voice and the great picking of Jerry Douglas on Dobro into the room. The sound of soprano Barbara Schlick performing in Bach’s Cantata 21 `Ich hatta viel Bekummernis’, by La Chappelle Royal, conducted by Philippe Herreweghe (Harmonia Mundi CD HMA 1951328), with her soaring individual voice surrounded by the choir came across with fine resolve. The ensemble play of Miles, Coltrane, Red Garland, Paul Chambers, and ‘Philly’ Joe Jones in the track ‘I Could Write A Book’ on Relaxin’ with the Miles Davis Quintet (XRCD VICJ-60125), came through as in a nightclub. The Aikido was certainly not embarrassed by the comparison with the Bottlehead I use in my system, and is something which could definitely be lived with. I think comparison with Steve’s ARC will probably be more telling. My friend was listening to the JJ tubed version of the Aikido. I was certain that the Aikido wouldn’t knock my ARC Reference 3 off of its well-deserved pedestal, and I was correct. What surprised me, though, was that the Aikido exhibited such a large proportion of the performance that has me smitten with the ARC. The question that one might ask is how much did I improve the stock kit by upgrading the output caps? My guess: a little but not very much. And using a $20 volume pot instead of $3 one? Again, not much but I’ll bet the channels track better especially at low volumes with the $20 pot. Could performance be improved even more with significantly pricier output caps, fancy resistors, more expensive jacks, internal wiring with name-brand cable, an exotic stepped attenuator in place of the volume pot and some expensive NOS tubes? My guess would be yes it can but not enough to justify the extra expense. As it stands now, I think the Aikido I built is at the apex of the price/performance intersection. But if you wish to build your own, by all means take it as far as your imagination and wallet will allow. Before taking the pictures that accompany this report, I connected the Aikido back into my system. Between my friend and me, we’ve put over 200 hours on the little line stage. After an hour or so of warming up playing some music, I did a bit of listening. The sound is slightly better than I remember. It sounds slightly smoother, yet more detailed. The transient response seems sharper; high frequency percussion instruments have more bite and detail. Cymbals have more splash, bells more tinkle and triangles more ting. This has not come at the expense of treble harshness or aggression. 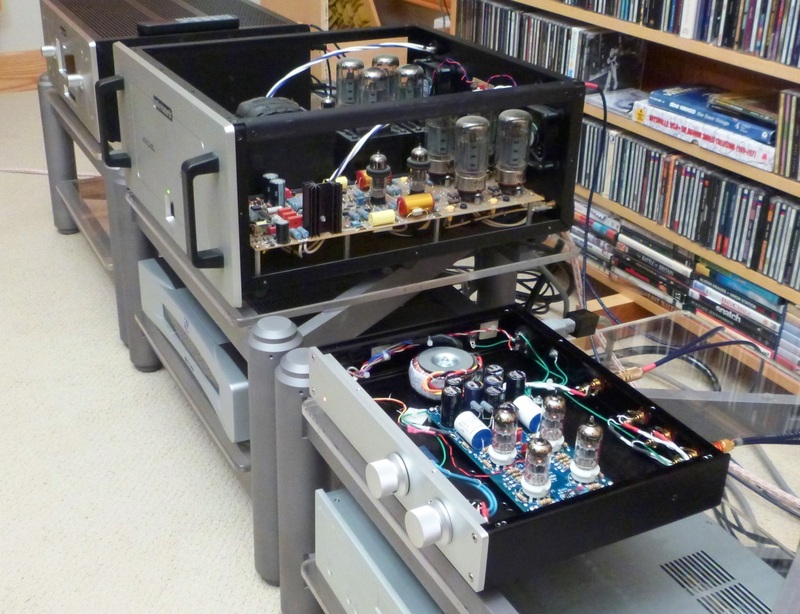 My guess is the tubes and capacitors needed some time to sound their best, and might improve even more. In Part 2, I’ll profile the Chinese line stage board that I bought on eBay. It may take a while, as one of the tubes shipped with the board was seriously defective with a very large heater-cathode leak. A replacement may take some time to arrive. Looking over the circuit (I had to trace out the board as no schematic was supplied), I found something quite surprising. That’s my teaser, ‘til next time. A quick word before I go: I see my word count is approaching 5000, for which I apologize. My enthusiasm gets the better of me at times, as Noam, my long suffering editor, can attest. Editor’s note: There is no such thing as too much enthusiasm. I’ve been a fan of Broskie’s offerings for years, and although they don’t typically receive reviews in the maintream audio press, I’m very happy this article is now up at Wall of Sound. I’d also remind readers of the wonderful Elekit TU-8500 preamp, which I built and reviewed a few months back.